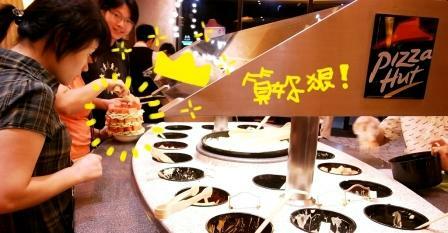 Pizza Hut is a roaring success in China. They opened their first restaurant in 1990, in Beijing. 18 years later, there are about 300 restaurants in more than 60 cities. 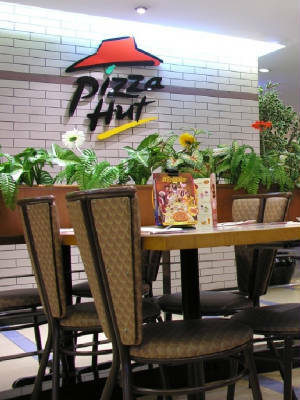 When Pizza Hut first came to China, only the privileged could include it in their dining repertoire; these days it’s enjoyed by large numbers of the burgeoning middle class (“over five million by 2005,” according to Pizza Hut’s own merchandising material). One of the tables-for-four next to the window was occupied by a father-and-son. The boy, about 12 years old, and his late-thirty-something dad, sat diagonally opposite each other, the father next to the window. The lad bounded over to his dad’s side to watch him go through the numerous promotions that were laid out – one to a page – on the “tent card” that had been placed on every table. After conferring, the father shook his head slightly and said to the boy, “wo ting nide” (whatever you say). It looked as if the specials – which were all offered at attractive prices – were not to the young lad’s liking. He went back to his place and started leafing through the main menu. Judging by the flurry of pointing, page-turning, and shouting-out of preferences, the boy was clearly excited by what he had seen. His Dad smiled and nodded his approval, without looking at the menu. The waitress, who was waiting at a discreet distance for the signal, came over when requested, and Dad had within moments expertly placed the order. This clearly wasn’t their first visit. Within a few minutes, the food had begun to arrive. It wouldn’t stop arriving for quite a while. The following scene is best read while playing the music to the sorcerer’s apprentice in your head. First came the sizzling snails, each in its own pot. “Xiaoxin, Re!” (Be careful! Hot!) warned Dad. The young lad was so keen to scoop every last juicy drop from the bowl that he stood up to perform the operation. The “herbal shrimp” was the next to arrive – which looked more like prawns, six of them, in breadcrumbs; followed by Spaghetti Bolognese; a few slices of garlic bread, which would form the base for the snails that were left; and a nine-inch “meat supreme” deep pan pizza. All of which was washed down with a Grapefruit Seduction smoothie. Then the lad really got into his stride. He stood up and began to work the dishes feverishly. Bite of pizza… snail on garlic bread… a prawn… some spaghetti… pizza… slurp of smoothie… and so it went on. Halfway through the lad’s feeding frenzy, Dad looked up from the meagre helpings in front of him to ask his son: “Ni chi bingqiling?” (Do you want an ice cream?). “Dangran,” (of course) said the boy, "a sundae!". The young chap was now attacking the sundae. And there was a lot to have a go at: vanilla, strawberry, and chocolate ice cream; two cylindrical chocolate wafers; peaches and cream; topped with a cherry; all of which was dripping with chocolate sauce. While he was having a break from the sundae – to have another go at the pizza – Dad grasped the opportunity, literally with both hands, to move the dessert dish over to his side of the table. The lad was having none of it, pouncing on the out of position sundae and wresting it back to its original place. Dad laughed, as if to say "that's my boy". Several seconds of inactivity clearly signalled to dad that it was time to ask for the bill. He also asked the waitress to “doggy-bag” the remaining half of the pizza. The meal had cost just a few yuan shy of 200 yuan (Over 14 pounds sterling). Miss Pan (honestly! ), the duty manager, came over to ask them if everything had been OK. “Feichang bang!” (really good) said Dad. In just under 45 minutes after entering the restaurant, they were out of the door. Not surprising, then, that they didn’t have time to talk very much during the meal. One of few things Dad said to his son during the eatathon was “make sure you do as well on your next test”. Which is a Chinese way of saying: "Fantastic result son! You did great. [Therefore] I’m so happy to treat you to whatever you like; you really deserve it!"